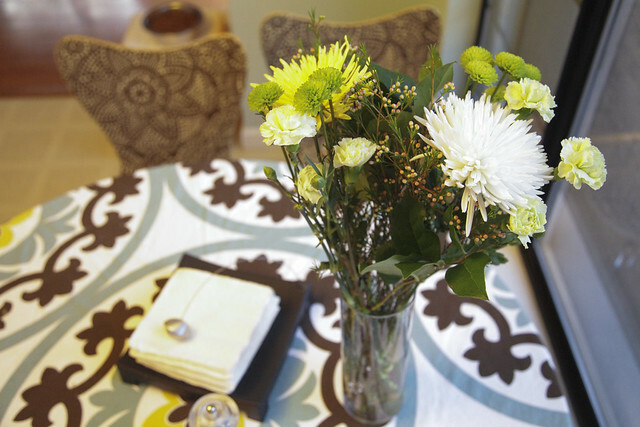 Clean the floors, stock up on green cleaners, and buy fresh flowers were on the to-do list for the weekend! 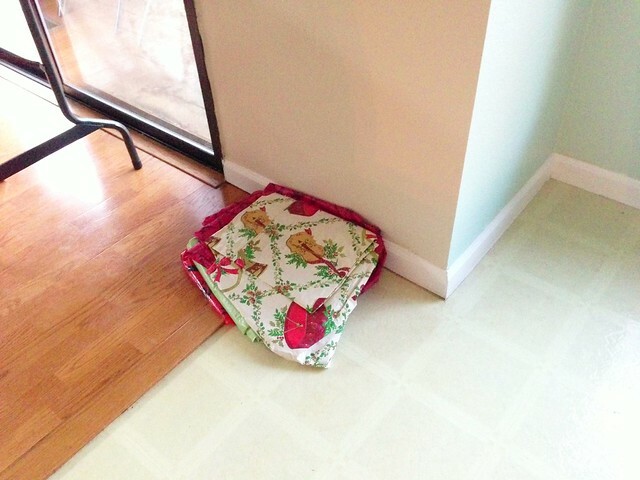 Thanks to my Roomba and to my sister (she helped steam mop the kitchen floors), my floors are all sparkly and clean! I’ve blogged previously about how I clean, and most of my cleaners are green (Method), so I was already good on that one. Here are my lovely flowers I picked up at the grocery store! Find a spot in your home that you rarely (maybe never!) sit in that gives you a view on a room or area that you feel is especially problematic. Take a seat on a chair (or the floor) and just observe for ten minutes. I chose to observe my living room from the point of view of my puppy. As I was playing with him, I laid on the floor and tried to see things from ‘the ground up.’ I focused on how very large but empty the walls feel, and I started imagining how I would change that. Maybe a new paint color or added texture from wall panels? Not much to report here. Our outbox has remained in the same place it always has: in between the kitchen and the media room. I actually managed to cross several things off my my list. It just kind of worked out that way. 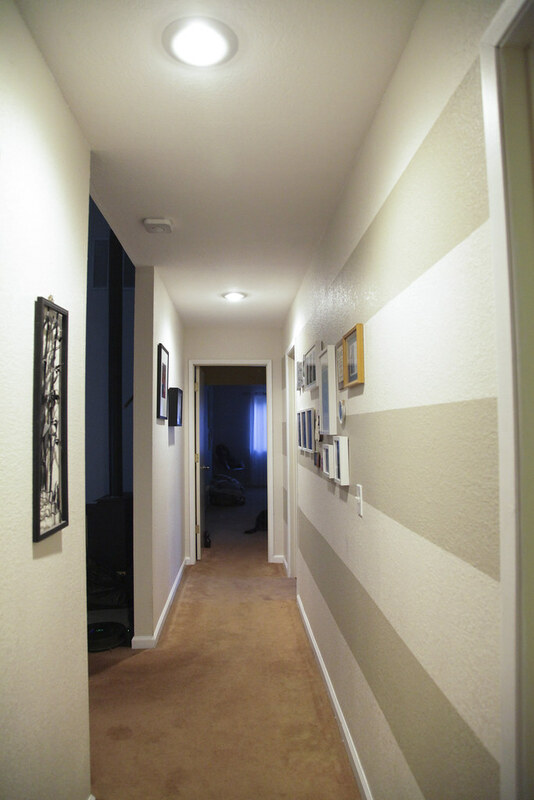 First off, I got the hallway ceiling painted, and I replaced my old smoke detector with a Nest Protect. I had a $10 rewards certificate for Best Buy, so I used it get the Nest Protect. I wanted to get the ceiling painted in the hallway before I installed it, so I stopped at Home Depot for some ceiling paint. First thing Saturday morning DirecTV came out to not only move our wall connection in the media room, but they also upgraded our box. 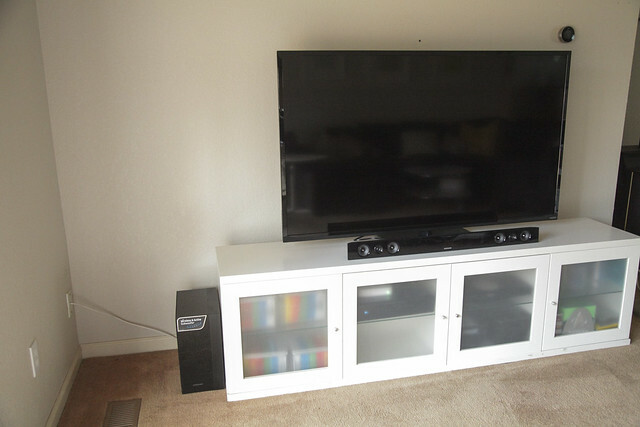 We got an unexpected refund check from our insurance, so we decided to splurge on a new TV for the living room and sound bar. We moved the old TV from the living room into the media room and got a sound bar for that as well. Oh and say hello to our new console we got back in September but didn’t take a picture of until now. Oops. 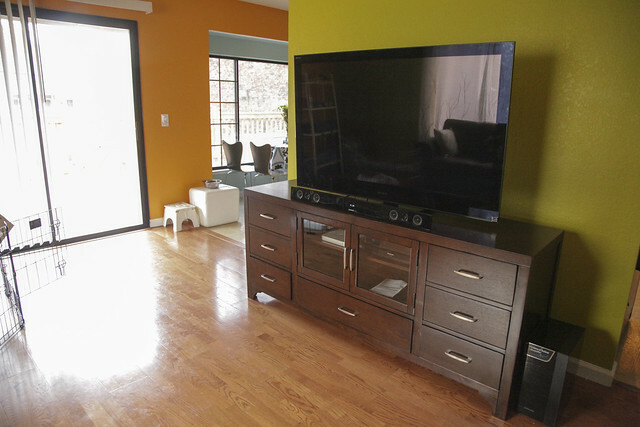 Mounting the TVs and sound bars to the wall is on the to-do list, but before we do that I want to repaint the walls in the living room. Guess I know what’s next!